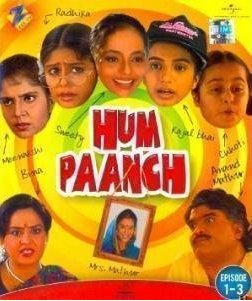 Episode #10 of Hindi TV Serial Hum Paanch follows the very popular theme of Mistaken Identities of the Boss, which we have visited many times in other TV Serials as well as movies (and even in books). 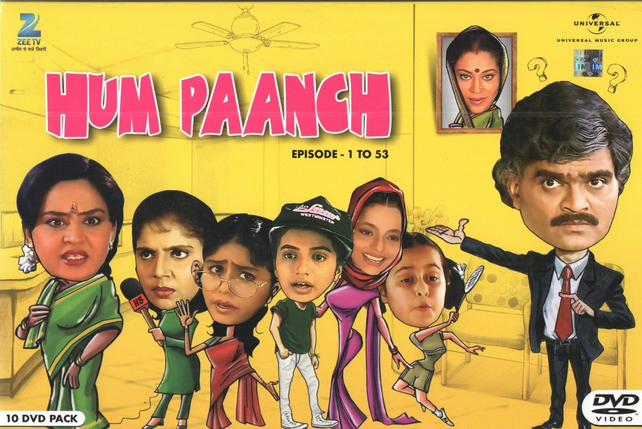 The episode starts with usual things happening at Mathur’s home. Though the introductory scene takes on the hearing aid of Radhika. Usually such takes are resulted into cheap comedy and often hurts the sentiments of the people with disabilities. The scene here however explores the things in nice way and you won’t feel that. The scene explores that the cells of the walkman (which was a kind of luxury and important item those days) of Sweety (given by Kajal to her) are dead and now she needs a fresh pair of cells to keep enjoying the music. You know that Kajal will try to do some “jugaad” rather than following the standard path to arrange those cells, right? Yes, it goes that way only. The scene however introduces us to the theme of the episode smoothly. If you pay attention you will see the attributes of all the characters (in the scene) are explored brilliantly. Sweety is just a happy-go-lucky beauty-without-a-brain kind of girl and some of the dumb questions she ask, or action she perform, reinforces the fact pretty well. Radhika is dependent on her hearing aid, she is otherwise a studious girl. Without her hearing aid she was able to create chaos though. And, Kajal you know is a “bhai” of the family. She never goes the traditional way to do almost anything. You will understand it when you will know the fact about the walkman she have arranged. Mr. Anand Mathur is a real life upper middle class family man who have a lot of things to look after. And with such dramatic 5 daughter and 2 wives (well, his late first wife keeps her presence felt through the photograph hanging on the wall!) he is working in a private office. He however lives his life happily (a typical tendency of a common-man) by stealing fun from even tense moments. He is mature enough to tackle tricky situations as well. Why we tell these? Well, the next segment of the episode have a lot to do with it. When the youngest daughter or Anand bring a news that Mr. Pandey got a promotion in his office, the things get challenging for Mr. Mathur. In addition to show the gossiping nature of various character, this scene focuses on the fact that at working place, sometimes you need to develop personal relations with your boos in order to get promotions or get your genuine work considered. If you love sitcoms and have watched other quality Hindi Sitcoms, this episode will definitely remind you of Bosses on Dinner episode of Hindi TV Serial – Yeh Jo Hai Zindagi. Now the challenge for Mr. Mathur is to convince his boss Mr. Popat Lal (played by famous actor Rajendra Nath), to come to his home for a dinner. The family promises to make him enjoy it for sure. And they hope that it will result into job promotion for Anand Mathur! Will it go that way? Well, you need to watch the episode to know. It is often said that content is the king. And it is true for almost any creation, be it a book or TV Serial or movie or something similar. However this episode offers nothing which you can say “completely new” or “path breaking”. The content is still good. It is nicely written and have some good performance to support it. And the “proper” direction makes it worth watching. This episode contains many scenes which you will not find funny at all. But, the good thing is there are no “double meaning dialogs” or “cheap comedy elements” found here. It makes it eligible to watch it with entire family. Which is in fact a very positive attribute. Ashok Sharaf is the top performer of this episode. His comic timings are just perfect. often you will think why such a brilliant actor didn’t get the roles to justify his talent. Shoma Anand is competent too. She is loud (as much needed). Rajendra Nath slips into the role very easily. He is typical though. His signature acting style is explored here, nothing specifically new is done by him. Bhairavi tries well to perform Kajal bhai, and she succeed at many places. Rakhi looks natural. Amita is good actress and she performs her part pretty well. A pleasant surprise is the actor playing the “donation seeking guy”. You have seen him in many movies and TV Serials in negative roles, and we cannot think that he can play such simple roles as well! Completely opposite of his persona. The dialogs are witty and at places it irks smile on your face. The camera work is genuine. The wardrobe is authentic. You will see regular people wearing regular cloths and ornaments (where necessary). “No heavy make-ups” makes actors look natural (otherwise, you often see the characters of various TV shows wearing heavy cloths and ornaments at home, and full make-up while even sleeping!!). Actually the simplicity of execution and portrayal makes it worth watching. Technically speaking, the dubbing could have been a lot better. Sometimes the background music overpowers the dialogs, which is not good. Our personal verdict: The highs are more than the lows, which makes the episode watchable. 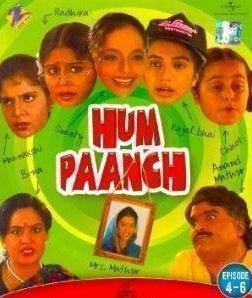 Did you watch this TV serial? What are your views about it? Do let us know your thoughts via comments below. If you like this article then do not forget to share it with your friends over various social networks via Twitter, Facebook, Google Plus and others. And yes, you may like to subscribe to our RSS feeds and follow us on various Social networks to get latest updates for the site to land right in your mail box. And yes, do let us know your remarks via comments below, we love to hear from you.